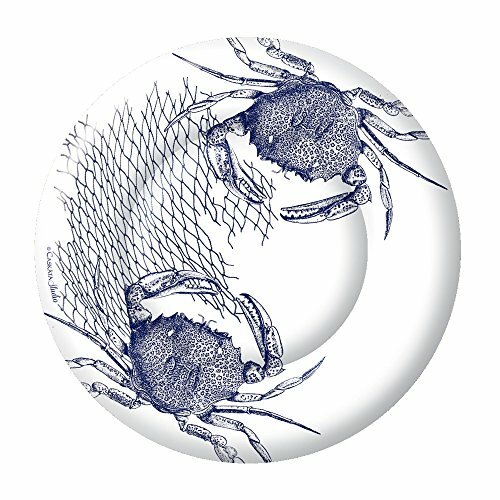 Cassata Studio napkins and plates begin with exquisite imagery but don't end there. As beautiful as they are practical, Ideal Home Range plates are made of heavyweight cardboard with a gloss finish that will hold up to heaping helpings. Arrange stunning place settings by pairing patterned plates with matching napkins and coordinating solids. Plates and napkins are offered in multiple sizes, allowing you to create dynamic, layered tables capes. IHR offers a sustainable option for conscientious consumers, using ink that is water soluble, contains no heavy metals or solvents of any kind and meets the requirements of German Food and Health laws and the USFDA. Used ink is never dumped into sewage and is always recycled and reintegrated into the color system. The production working area is naturally pollution-free and no harmful emissions are produced. IHR has earned a certificate of approval from the Forest Stewardship Council (FSC), a prestigious certificate only awarded to those who meet all of the FSC's standards for sustainability, forest management, well being of the forest workers and effects on indigenous peoples and the local environment. Ideal Home Range is exclusively represented in the United States by Boston International and is considered to be the international market leader and trendsetter in the field of high-class table decoration and interior accessories. IHR began in an old village school in Germany in 1977, when Ingrid and Hanja Rick conceived the idea of producing accessories in the arts and crafts tradition in order to communicate their concept of interior design. They soon discovered the tissue napkin as a design object and the basis of stylish table decorations and turned it into the key feature of their product. More than 8,000 items are offered today in most countries of the world.